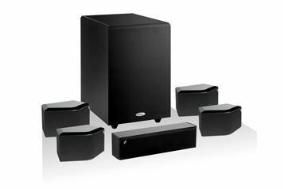 Crystal Acoustics introduces £550 bipolar 5.1 surround system | What Hi-Fi? It consists of four compact, bipolar satellite speakers each housing a pair of 7.5cm mid/bass drivers and a 2.5cm silk-dome tweeter. The bipolar driver arrangement – the two 7.5cm drivers pointing in different directions, wired in-phase – are said to "outperform conventional two-way speaker arrangements", delivering greater ambience and spaciousness. They can be wall mounted, placed horizontally or vertically, and are magnetically shielded so can be positioned close to a TV screen. A timbre-matched centre channel speaker uses the same drive units as the satellite speakers, while the THX Select-certified THX-10SUBt with built-in 120W amplifier handles the bass frequencies.